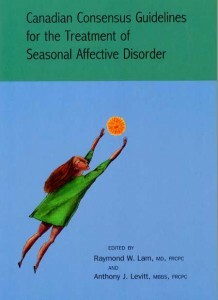 The first comprehensive clinical guide to the diagnosis and treatment of seasonal affective disorder (SAD), or winter depression. The book is now out-of-print, but many of the clinical guidelines are still applicable, so we offer a free download in pdf format: CCG SAD 1999. This is the first comprehensive clinical guide for the diagnosis and treatment of seasonal affective disorder (SAD), a type of clinical depression that affects between 2% and 3% of the Canadian population. Drs. Raymond W. Lam and Anthony J. Levitt, leading clinician-researchers in SAD, organized a Canadian Consensus Group to develop consensus guidelines for the treatment of SAD. Using a rigorous consensus process, the members of this group reviewed the world scientific literature and formulated evidence-based recommendations for the diagnosis and treatment of SAD. Draft guidelines were extensively discussed, reviewed by international experts in the field, and then ratified by the Canadian Consensus Group. This book is the final result. The question-and-answer format of the guidelines makes them readily accessible to busy clinicians. Summary tables of recommendations and conclusions allow rapid access to the most important information. A rating of level of scientific evidence is included after every recommendation so that areas of controversy or limited data are highlighted. A full bibliography of over 650 references, updated to June 1, 1999, is also included as a resource for researchers. These guidelines will be clinically useful to family doctors, psychiatrists, psychologists, nurses, and other health professionals who treat depression and SAD. Researchers and students will find the concise reviews of the literature highly informative. Knowledgeable consumers and family members will also discover practical information and answers to many of their questions about SAD. Raymond W. Lam is Professor and Head of the Division of Mood Disorders, Department of Psychiatry, University of British Columbia, and Medical Director of the Mood Disorders Program, UBC Hospital, Vancouver. Anthony J. Levitt is Associate Professor in the Departments of Psychiatry and Nutrition, University of Toronto, and Head of the Mood Disorders Program, Sunnybrook Health Sciences Centre, Toronto.